The terms “magnetizer” and “mesmerizer” have been applied to people who study and practice animal magnetism. These terms have been distinguished from “mesmerist” and “magnetist”, which are regarded as denoting those who study animal magnetism without being practitioners; and from “hypnotist”, someone who practises hypnosis. The etymology of the word magnetizer comes from the French “magnetiseur” (“practicing the methods of mesmerism“), which in turn is derived from the French verb magnetiser. The term refers to an individual who has the power to manipulate the “magnetic fluid” with effects upon other people present that were regarded as analogous to magnetic effects. This sense of the term is found, for example, in the expression of Antoine Joseph Gorsas: “The magnetizer is the imam of vital energy”. A tendency emerged amongst British magnetizers to call their clinical techniques “mesmerism”; they wanted to distance themselves from the theoretical orientation of animal magnetism that was based on the concept of “magnetic fluid”. At the time, some magnetizers attempted to channel what they thought was a magnetic “fluid”, and sometimes they attempted this with a “laying on of hands“. Reported effects included various feelings: intense heat, trembling, trances, and seizures. Many practitioners took a scientific approach, such as Joseph Philippe François Deleuze (1753–1835), a French physician, anatomist, gynecologist, and physicist. One of his pupils was Théodore Léger (1799–1853), who wrote that the label “mesmerism” was “most improper”. (Léger moved to Texas around 1836). 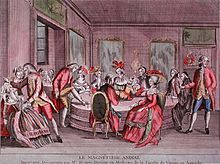 In 1784 a French Royal Commission appointed by Louis XVI studied Mesmer’s magnetic fluid theory to try to establish it by scientific evidence. The commission included Majault, Benjamin Franklin, Jean Sylvain Bailly, Jean-Baptiste Le Roy, Sallin, Jean Darcet, de Borey, Joseph-Ignace Guillotin, Antoine Lavoisier, Poissonnier, Caille, Mauduyt de la Varenne, Andry, and de Jussieu. Whilst the commission agreed that the cures claimed by Mesmer were indeed cures, it also concluded there was no evidence of the existence of his “magnetic fluid”, and that its effects derived from either the imaginations of its subjects or charlatanry. Magnetism has taken effect upon persons of different sexes and ages. … In general, magnetism does not act upon persons in a sound state of health. … Neither does it act upon all sick persons. … we may conclude with certainty that this state exists, when it gives rise to the development of new faculties, which have been designated by the names of clairvoyance; intuition; internal prevision; or when it produces great changes in the physical economy, such as insensibility; a sudden and considerable increase of strength; and when these effects cannot be referred to any other cause. … We can not only act upon the magnetized person, but even place him in a complete state of somnambulism, and bring him out of it without his knowledge, out of his sight, at a certain distance, and with doors intervening. … The greater number of the somnambulists whom we have seen, were completely insensible … we might pinch their skin, so as to leave a mark, prick them with pins under the nails, &c. without producing any pain, without even their perceiving it. Finally, we saw one who was insensible to one of the most painful operations in surgery, and who did not manifest the slightest emotion in her countenance, her pulse, or her respiration. … Magnetism is as intense, and as speedily felt, at a distance of six feet as of six inches; and the phenomena developed are the same in both cases. Abbé Faria was one of the disciples of Franz Anton Mesmer who continued with Mesmer’s work following the conclusions of the Royal Commission. In the early 19th century, Abbé Faria is said to have introduced oriental hypnosis to Paris and to have conducted experiments to prove that “no special force was necessary for the production of the mesmeric phenomena such as the trance, but that the determining cause lay within the subject himself”—in other words, that it worked purely by the power of suggestion. psychological science [would] therefore [be most aptly] designated Rational Mesmerism. According to an anonymous writer of a series of letters published by editor John Pearson in 1790, animal magnetism can cause a wide range of effects ranging from vomiting to what is termed the “crisis”. The purpose of the treatment (inducing the “crisis”) was to shock the body into convulsion in order to remove obstructions in the humoral system that were causing sicknesses. Furthermore, this anonymous supporter of the animal magnetism theory purported that the “crisis” created two effects: first, a state in which the “[individual who is] completely reduced under Magnetic influence, although he should seem to be possessed of his senses, yet he ceases to be an accountable creature”, and a second “remarkable” state, which would be “conferred upon the [magnetized] subject … [namely] that of perfect and unobstructed vision … in other words, all opacity is removed, and every object becomes luminous and transparent”. A patient under crisis was believed to be able to see through the body and find the cause of illness, either in themselves or in other patients. The Marquis of Puységur‘s miraculous healing of a young man named Victor in 1784 was attributed to, and used as evidence in support of, this “crisis” treatment. The Marquis was allegedly able to hypnotize Victor and, while hypnotized, Victor was said to have been able to speak articulately and diagnose his own sickness. Although the doctor’s obsession with the use of animal magnetism, not merely to cure but to force his ward to fall in love with him, made for a humorous storyline, Inchbald’s light-hearted play commented on what society perceived as threats posed by the practice. De Mainanduc brought animal magnetism to England in 1787 and promulgated it into the social arena. In 1785, he had published proposals to the ladies of Britain to establish a “hygean society” or society of health, by which they would pay to join and enjoy his treatments. As both popularity and skepticism increased, many became convinced that animal magnetism could lead to sexual exploitation of women. Not only did the practice involve close personal contact via the waving of hands over the body, but people were concerned that the animal magnetists could hypnotize women and direct them at will. William Pitt, the great political Animal Magnetist, … has most foully worked on the diseased fancy of Englishmen … thrown the nation into a feverish slumber, and is now bringing it to a crisis which may convulse mortality! In his article “Under the Influence: Mesmerism in England”, Roy Porter notes that James Tilly Matthews suggested that the French were infiltrating England via animal magnetism. Matthews believed that “magnetic spies” would invade England and bring it under subjection by transmitting waves of animal magnetism to subdue the government and people. Such an invasion from foreign influences was perceived as a radical threat. During the Romantic period, mesmerism produced enthusiasm and inspired horror in the spiritual and religious context. Though discredited as a credible medical practice by many, mesmerism created a venue for spiritual healing. Some animal magnetists advertised their practices by stressing the “spiritual rather than physical benefits to be gained from animal magnetism” and were able to gather a good clientele from among the spiritually inspired population. Sporadic research into animal magnetism was conducted in the 20th century, and the results published; for example, Bernard Grad wrote a number of papers related to his observations of “a single, reputed healer, [Hungarian] Oskar Estebany” on the subject. In the Classical era of animal magnetism, the late 17th century to the mid-19th century, there were professional magnetizers, whose techniques were described by authors of the time as particularly effective. Their method was to spend prolonged periods “magnetizing” their customers directly or through “mesmeric magnets”. It was observed that in some conditions, certain mesmerizers were more likely to achieve the result than others, regardless of their degree of knowledge. ^ Hull, Clark L. “Hypnotism in Scientific Perspective”, The Scientific Monthly 29.2 (1929): p. 156. ^ Gilles de la Tourette. “The Wonders of Animal Magnetism”, The North American Review 146.375 (1888): p.131-132. Barth, George H., The Mesmerist’s Manual, London (1851), Reprint, ISBN 978-1532953002. Chenevix, R., “On Mesmerism, Improperly Denominated Animal Magnetism”, London Medical and Physical Journal, Vol.61, No.361, (March 1829), pp. 219–230; No.364, (June 1829), pp. 491–501; Vol.62, No.366, (August 1829), pp. 114–125; No.367, (September 1829), pp. 210–220; No.368, (October 1829), pp. 315–324. Donaldson, I.M.L., “Mesmer’s 1780 Proposal for a Controlled Trial to Test his Method of Treatment Using ‘Animal Magnetism'”, Journal of the Royal Society of Medicine, Vol.98, No.12, (December 2005), pp. 572–575. Fulford, T., “Conducting the Vital Fluid: The Politics and Poetics of Mesmerism in the 1790s”, Studies in Romanticism, Vol.43, No.1, (Spring 2004), pp. 57–78. Gauld, A., “Reflections on Mesmeric Analgesia”, British Journal of Experimental and Clinical Hypnosis, (5), 17-24. Harte, R., Hypnotism and the Doctors, Volume II: The Second Commission; Dupotet And Lafontaine; The English School; Braid’s Hypnotism; Statuvolism; Pathetism; Electro-Biology, L.N. Fowler & Co., (London), 1903. Kaplan, F., “”The Mesmeric Mania”: The Early Victorians and Animal Magnetism”, Journal of the History of Ideas, Vol.35, No.4, (October–December 1974), pp. 691–702. Mancini, S. & Vale, J., “Animal Magnetism and Psychic Sciences, 1784-1935: The Rediscovery of a Lost Continent”, Diogenes, Vol.48, No.2, (1 June 2000), pp. 94–101. Parssinen, T.M., “Mesmeric Performers”, Victorian Studies, Vol.21, No.1, (Autumn 1977), pp. 87–104. Pattie, F.A., “Mesmer’s Medical Dissertation and Its Debt to Mead’s De Imperio Solis ac Lunae“, Journal of the History of Medicine and Allied Sciences, Vol.11, (July 1956), pp. 275–287. Porter, R., “‘Under the Influence’ Mesmerism in England”, History Today, Vol.35, No.9, (September 1985), pp. 22–29. Rosen, G., “Mesmerism and Surgery: A Strange Chapter in the History of Anesthesia”, Journal of the History of Medicine and Allied Sciences, Vol.1, No.4, (October 1946), pp. 527–550. Sutton, G., “Electric Medicine and Mesmerism”, Isis, Vol.72, No.3, (September 1981), pp. 375–392.